1927: he makes his first stage appearance in Ôsaka at the Naniwaza. March 1934: he takes the name of Jitsukawa Enjirô II at the Ôsaka Kabukiza, playing the role of Soga Jûrô in the drama "Ikitate Soga". October 1947: Enjirô plays for the first time the role of Sanbasô in the dance "Ayatsuri Sanbasô", which is staged at the Misonoza (Nagoya); his stage partners are Nakamura Ganjirô II (Okina) and Nakamura Senjaku II (Senzai). February 1951: his father Jitsukawa Enjaku II dies. September 1953: premiere at the Ôsaka Kabukiza of the dance "Ryûko", starring Bandô Minosuke VI and Enjirô in the roles of the Dragon and the Tiger. April 1954: revival (the 1st since the end of WW2) at the Nakaza of Katsu Genzô III's drama "Ogasawara Sôdô"; Enjirô plays the roles of Ogasawara Haito, the yakko Kikuhei (in reality the fox of Mt. Myôjin) and Koheiji [casting]. January 1955: premiere at the Ôsaka Kabukiza of Uno Nobuo's drama "Naniwa no Ashi"; Enjirô plays the role of Yumihiko [casting]. July 1956: premiere at the Ôsaka Kabukiza of the dance-drama "Uma Nusubito"; Enjirô plays the role of Sunezô [casting]. March 1958: Enjirô takes part in the final Kabuki performance at the Ôsaka Kabukiza [more details]. September 1958: Enjirô makes a great performance at the Nakaza (Ôsaka), playing the roles of Kumagai Naozane, Issun Tokubê and Yohei in the dramas "Kumagai Jin'ya", "Natsu Matsuri Naniwa Kagami" and "Abura no Jigoku". December 1958: Enjirô plays at the Minamiza (Kyôto) the role of Yoemon in the dance-drama "Iro Moyô Chotto Karimame"; the role of Kasane is played by Ôtani Tomoemon VII. May 1959: Enjirô plays at the Meijiza the roles of Issun Tokubê and Mikawaya Giheiji in the drama "Natsu Matsuri Naniwa Kagami". June 1959: Enjirô plays at the Minamiza the role of Gofukuya Jûbê in the "Numazu" scene of the drama "Igagoe Dôchû Sugoroku". His stage partners are Kataoka Nizaemon XIII (Heisaku) and Ôtani Tomoemon VII (Oyone). The play is performed with the same casting in July in Nagoya at the Misonoza. February 1960: premiere at the Kabukiza of Uno Nobuo's drama "Shiranui Kengyô"; Enjirô plays the role of Tobaya Tamatarô [casting]. January 1961: Enjirô plays at the Nakaza (Ôsaka) 5 roles in the classic "Kanadehon Chûshingura": Kô no Moronô, Ôboshi Yuranosuke, Hayano Kanpei, Sadakurô and Yoichibê. June 1961: Enjirô plays for the first time the role of Danshichi Kurobê in the drama "Natsu Matsuri Naniwa Kagami", which is staged at the Tôyoko Hall (Tôkyô). This role is one of the most prestigious ones in the Kamigata Kabuki. November 1962: revival at the Kabukiza of the drama "Fudô", which belongs to the Kabuki Jûhachiban; Enjirô plays the role of Hayakumo Daijin [more details]. March 1963: Jitsukawa Enjirô II takes the name of Jitsukawa Enjaku III at the Kabukiza, playing the roles of Narihira and Kameya Chûbê in the dramas "Suma no Utsushie" and "Fûin Giri". September 1963: Enjaku celebrates his shûmei at the Ôsaka Shinkabukiza, playing the roles of Ishikawa Goemon and Kameya Chûbê in the dramas "Sanmon Gosan no Kiri" and "Fûin Giri". 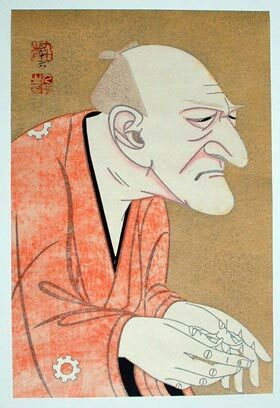 Ishikawa Goemon was the most famous role of his late father Jitsukawa Enjaku II. October 1963: Enjaku celebrates his shûmei in Nagoya at the Misonoza, playing the roles of Kingorô and Kameya Chûbê in the dramas "Kosan Kingorô" and "Fûin Giri". December 1963: Enjaku plays for the first time the role of Heisaku in the "Numazu" scene of the drama "Igagoe Dôchû Sugoroku", which is staged at the Kabukiza. His stage partners are Morita Kan'ya XIV (Gofukuya Jûbê) and Ôtani Tomoemon VII (Oyone). January 1965: premiere at the Nakaza of the spectacular hengemono "Ôtsue Dôjôji"; Enjaku plays the roles of the wisteria maiden, a falcon-handler, a zatô, a boatman and the ôtsue demon [more details]. July 1968: revival at the Kabukiza of the drama "Kama-ga-Fuchi Futatsu Domoe"; Enjaku plays the role of Ishikawa Goemon [casting]. June 1969: Enjaku plays the role of the villain Soga no Iruka in the great revival (4 acts) of the classic "Imoseyama Onna Teikin", which is staged at the National Theatre. January 1971: Enjaku plays at the Kabukiza the role of the villain Matsunaga Daizen in the jidaimono "Gion Sairei Shinkôki". His stage partners are Nakamura Shikan VII (Princess Yuki) and Morita Kan'ya XIV (Tôkichi). June 1972: tour in Europe. April 1976: the National Theatre produces the revival in 5 acts and 9 scenes of Namiki Gohei I's drama "Kinmon Gosan no Kiri"; Enjaku plays the leading role of Ishikawa Goemon [casting]. April 1981: revival at the National Theatre of Nishizawa Ippô's drama "Keisei Hama no Masago"; Enjaku plays the roles of Saitô Kuranosuke and Toyotomi Hisayori [casting]. January 1984: Enjaku plays for the last time the role of Goemon in the drama "Sanmon Gosan no Kiri", which is staged at the Kabukiza. June 1985: Enjaku plays for the last time the role of Kameya Chûbê in the drama "Fûin Giri", which is staged at the Nakaza (Ôsaka); the role of the courtesan Umegawa is played by Nakamura Matsue V.
April 1987: Enjaku takes part in the revival at the Meijiza of the play "Jûni Hitoe Komachi Zakura", which includes the famous Tokiwazu-based dance-drama "Tsumoru Koi Yuki no seki no To" [more details]. December 1988: Enjaku plays for the last time the role of Heisaku in the "Numazu" scene of the drama "Igagoe Dôchû Sugoroku", which is staged at the Minamiza (Kyôto). His stage partners are Nakamura Senjaku II (Gofukuya Jûbê) and Sawamura Sôjûrô IX (Oyone). January 1990: Enjaku plays for the last time the role of Sanbasô in the dance "Ayatsuri Sanbasô", which is staged at the Kabukiza. His stage partners are Sawamura Sôjûrô IX (Okina) and Ichikawa Monnosuke VII (Senzai). December 1990: Enjaku appears on stage for the last time, in Kyôto at the Gion Kaburenjô, playing the role of Hayano Kanpei in the michiyuki "Michiyuki Tabiji no Hanamuko"; the role of Okaru is played by Onoe Baikô VII. Jitsukawa Enjaku III was a great tachiyaku of the second half of the twentieth century, trained in the traditions of the Kamigata Kabuki. He unfortunately died without a son to transmit his art and name, putting an end to the Jitsukawa clan.